(updated/re-blogged) DIY: How to Turn Off Auto-Run and Auto-Play in Windows PC | iStoryang HaaayTek! When i first wrote this article in 2009, it was the time when the Conficker worm had infected more than 20 million computers around the world via USB stick sharing. So, the need to secure computer systems against worm-carrying USB stick was high and there was a need for PC users to disable the Windows Auto-Run and Auto-Play features. 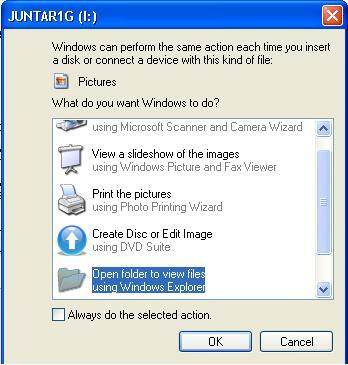 The autorun.inf file is being used by Microsoft Operating System to manage the USB whether to show an icon image of the USB drive folder in the MyComputer or to launch an application from the stick. At the same time, the Auto-Play will allow the system to instantly play any disk in the optical drive. However, virus and malware writers found the autorun.file a great launching pad for their evil tricks. Virus can change and modify the settings found in the autorun.inf file which is in a notepad format. Normally, when you inserted a USB stick, a dialogue box such as below will open and will ask you what application program you should use to open the content of your USB stick. If you disable the Auto-Run/Auto-Play features, this dialogue box will no longer appear after a USB stick ro CD disk is inserted into your PC. From time-to-time we have been encountering problems on our USB sticks, especially after we have inserted our USB sticks into other PC units. In this article, i am presenting two ways to disable the Auto-Run and Auto-Play features by: 1.) Manually disable the features and 2.) Using Panda USB Vaccine software. 1.) Be sure you have administrative rights on your PC. 3.) Group Policy window opens, click Administrative Template at the left pane, then click System folder. Look for the item “Turn Off Autoplay” at the right pane and double click it. 4.) “Turn off Autoplay Properties” window opens. Select ENABLED radio button. Select “All drives” in “Turn Off Autoplay on” section. Press OK. I have stumbled this free application offering vaccine on USB sticks several months after i wrote the manual disabling of the Auto-Run and Auto-Play features in Windows. It’s the Panda USB vaccine. I tried it and it works. It can “vaccinate” your PC and your USB sticks and ultimately disable the autorun feature. By disabling the auto-run feature, your system will not automatically open any USB stick and any CD inserted into your machine. I have already discussed above how to disable the auto-run/auto-play features of Windows. 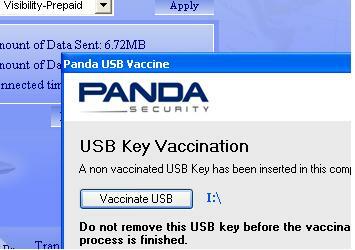 The Panda USB vaccine is easier and it does the disabling of the auto-run in seconds. The screen shot below is the latest version of Panda.You can download it here for free. You can also opt to remove the vaccine on your PC and USB stick anytime. You can also set that all USB sticks inserted into your machine will be “vaccinated” automatically. In my case, i chose not to automatically apply the vaccine to all USBs hence other USB sticks may be inserted into my machine. The image below shows Panda detecting a non-vaccinated USB stick inserted into the machine. Once your USB stick is “vaccinated” by Panda USB vaccine, the autorun.inf file will no longer be changed and modified by any virus. It will also prevent any virus to create an autorun.inf file. You’re done! Any USB stick/flash drive that will be inserted into your USB port shall no longer execute Auto-Play/Auto-Run. Therefore, virus like downadup/conficker worm won’t execute automatically. However, take note that your optical drive will also not play automatically because you have selected to turn off the “all drives” auto-play feature in the manual disabling or by vaccinating your PC using Panda. Anyway, you can still open the CD or DVD discs by opening it at the MyComputer folder. However, if you encountered problems starting your CD or DVD you can just turn on once again the autoplay feature for your CD by following same procedure above and revert back to autoplay status.